J/News Articles: J/FEST Southwest Announcement! (Houston, TX)- This year’s J/FEST Southwest Regatta will be taking place from October 12th to 14th, hosted by Lakewood YC on Clear Lake and on Galveston Bay. Again, all J/Owners are invited to participate and the hope is that several one-design fleets will have starts, including J/22s, J/24s, J/70s, J/105s at a minimum! 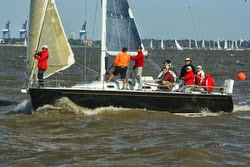 Plus, there will be PHRF racing for the larger J’s. Come one, come all! Never too late to head south and enjoy some fun in the Texas sun, great beer, and awesome TexMex food! Since it was such a HUGE hit last year, the “LEGENDS RACE” will take place on Clear Lake, right in front of the club. This year, it will be a fleet of J/22s and J/24s, with live commentary on-site and on Facebook Live off the patio of the “party-barge” called BARGE 295. There will be five (5) video cameras recording the live action! It will be a blast for everyone! IF you have any questions at all, please contact Scott Spurlin at mobile- 512-423-2179 or email- scott@jboatssouthwest.com Watch the J/FEST Southwest promo highlights video here. For more J/FEST Southwest sailing and registration information. Add to Flipboard Magazine.